The parish church of the Holy and Undivided Trinity, Ossett, is situated on a plateau, some 300ft above sea level, amid 5½ acres of land, including a cemetery where 16,000 people are buried, and which by 2007 had been full for about 12 years. The spire on top of the central tower rises to a height of 226ft, one of the tallest in Yorkshire. In 1862, Benjamin Ingham junior (1810-1872), a Leeds-born businessman based at Marsala in Sicily subscribed £1,000 towards the construction of a church "more suited to the needs of a rapidly industrialising community" in the town of Ossett. Ben Ingham was the nephew of Ossett-born, Benjamin Ingham senior (1783-1861), who had built up the massive trading dynasty of Ingham, Whitaker and Co. in Sicily, which was worth many millions of pounds on his death in 1861 at Palermo. Besides working for his uncle, Ben Ingham became the acting British consul at Marsala, Sicily in 1848, protecting the interests of British wine merchants who were based there. His uncle, Benjamin Ingham senior married late in life and had no issue. His nephews and great-nephews from the Whitaker and Ingham families of Yorkshire subsequently inherited (and spent) his vast fortune and ran the family business, based principally in Sicily, the USA and England. Benjamin Ingham junior also donated £500 to the Ripon cathedral restoration fund. In 1871, two principal nephews of Benjamin Ingham senior, Joseph Whitaker of Palermo (1802-1884) and Benjamin Ingham junior announced their intention of erecting, at their joint expense, a church in which Services of the Church of England could be performed for the spiritual benefit of their protestant countrymen, whether resident or visiting Palermo. Benjamin Ingham junior donated the land in front of Palazzo Ingham (now the Hotel delle Palme) to be used as the site for the new church. However, Benjamin Ingham junior died in Paris in 1872, before the work on the church started, but his widow Emily Ingham continued the good work and later, in 1872, the foundations were laid and building commenced. All the expenses of the building of the Anglican Church in the street of "via Roma" were paid for by the Ingham and Whitaker families. Back in Ossett, space constraints in the town centre, where the old church had been built, made it necessary to relocate to a much larger site. It was decided that the new church would be erected alongside the new Anglican graveyard that had been laid out in 1861 on Field Lane, on the (then) edge of town. The architect in overall charge of the project was William Henry Crossland of Leeds and the sculptor was a Mr. Ruddock, a native of Horbury and, it was said, he was one of the best pupils of Sir George Gilbert Scott, whose Gothic Revival influence is apparent in the design of the church. 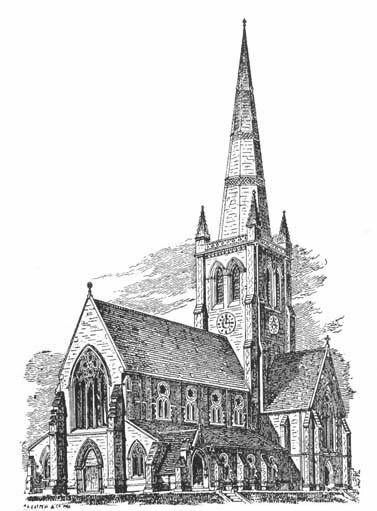 On the 30th June 1862, the foundation stone for the new church was laid by the vicar, the Reverend Thomas Lee, and to Lee's credit, he also placed the final stone on top of the steeple in May 1865. Though initially estimated at £8,000, alterations and additions to the original plans ensured that the final cost of construction amounted to at least £20,000. Such was the scale of the project that, during the consecration service on Friday 14th July 1865, the Bishop of Ripon, Dr. Bickersteth, made reference to ‘this miniature cathedral,’ which was one with which 'few churches in the diocese could compare and still fewer surpass.' Ossett stood in the Diocese of Ripon from 1836 until the Diocese of Wakefield was created in 1888. "The event was one of the most important in the annals of Ossett, and one anxiously anticipated by it and surrounding towns. The day, though not as auspicious as could have been desired, was much better than its immediate predecessors. The sun was obscured by portentous clouds, and the air lacked the genial warmth usually prevalent at the season of the year, but little rain fell, and the weather on the whole might be regarded as favourable. The hour appointed for the ceremony was eleven o'clock and the bells rang out merry chimes previously. The service commenced with with a procession formed of choristers and upwards of fifty clergymen, robed in surplices, with the churchwardens and Dr. Bickersteth, the Bishop of Ripon. As it passed up the centre aisle from the west door to the chancel, the Bishop repeated the 24th Psalm. The vicar, the Rev. Thomas Lee, M.A. (later the vicar of Islington, North London), assisted in the service. Concluding his sermon, the Bishop said that of the many churches that he had consecrated in the diocese that would stand in the foremost rank for design and beauty of architecture few would compare with it. Afterwards, the surrounding burial ground was consecrated. At two o'clock a goodly company sat down to a sumptuous luncheon at the Church School (later a rag warehouse) in Dale Street, which was beautifully decorated for the occasion. More than 300 ladies and gentlemen sat down to the repast. In the evening, Archdeacon Musgrave, vicar of Halifax, and son of a former Archdeacon of York, preached in the new church to a crowded congregation. The collection during the day made a grand total of £325." Holy Trinity Church was built between 1862-65, consisting of a chancel, nave, aisles, southwest porch and a 110ft high tower with a spire 116 feet high, rising from the intersection of the nave and transept, and containing a clock and 8 bells cast in 1865. The style of the architecture is English Gothic of the early second or geometric period. The building, made from Yorkshire stone, is in the shape of a Roman cross measuring 145 feet in length and 56 feet in width internally, with transepts 11 feet in depth. The height of the nave from floor to roof ridge is 67 feet. The nave arcade shafts are of alternate red and blue polished Aberdeen granite surmounted by richly carved capitals. The East Window (gifted by Benjamin Ingham of Palermo) and the West Window (funded by the Whitaker family of Ossett) are fine examples of stained glass. There are sittings for 1,000 persons. The Parish Register dates from the year 1792. The contractors responsible for the construction of the church were Messrs. Hampshire, masons, Huddersfield; J.W. Sykes, joiner; Snowdon Brothers, plumbers, Ossett, and Joseph Snowden, painter. Among the relics retrieved from previous structures in Ossett are the Royal Arms mounted above the west porch, the font of 1713 located in front of the pulpit and the commemorative stone removed from the 1806 church tower and now preserved in the south porch. The south transept houses the organ, built by Isaac Abbott of Leeds in 1886, subsequently rebuilt by Abbott and Smith in 1927 and then again partially restored in 2000/01. The central tower originally housed a peal of eight bells, gifted by Benjamin Ingham of Palermo and Mrs. Joshua Whitaker of Ossett. The bells were cast at a cost of £800 by John Taylor and Company of Loughborough in 1864. The weight of the bells is 5 tons, the tenor bell alone weighing nearly 27 hundredweight. The bells were received with much ceremony at Flushdyke railway station in June 1865. They were transported to their new home via the Carpenter's Arms and the George Inn, where the Ossett bandsmen accompanying the bells en route to Holy Trinity partook of essential liquid refreshment, which was provided 'on the house'. These same bells were recast by their original makers in 1934 and re-dedicated as part of a new ten bell peal. A four-faced clock, funded by public subscription, was installed in the tower in 1866. In 1996, Holy Trinity was given Grade II Listed Building status by English Heritage and this was later elevated to Grade II* in 1998. The church is the only building in Ossett to receive this classification and it is one of the top 6% of listed buildings nationwide. It was listed because of its impact on the skyline and because of the fine stained glass windows. The church has recently been subject to a £300,000 regeneration project with the work being completed by Easter 2007. An English Heritage grant of £190,000 has allowed essential roofing work to be carried out, and two-thirds of the roof tiles have been replaced. The building is now water-tight for the first time in ten years. In 2003, thanks to this extensive regeneration programme, the building was removed from the English Heritage 'at risk' register. Future plans for the church, which is now known as Trinity Church, include building on their already strong community links, to open up the impressive building’s potential uses, to include it as a venue for arts and performances.